To evaluate the kidney function after living kidney donation, we measured serum creatinine (SCr), cystatin C, and neutrophil gelatinase-associated lipocalin (NGAL) of 42 living donors before uninephrectomy and in three immediate days after it. We also evaluated the prevalence of the occurrence of the different stages of acute kidney injury (AKI) classified according to risk, injury, failure, loss, and end-stage (RIFLE) criteria, and accuracy of each of these three biomarkers for predicting them were evaluated. Significant serum NGAL (s-NGAL) changes were limited to the 1 st day after donation, whereas SCr and cystatin C changes continued to the third day after donation. s-NGAL level in the 1 st day and serum cystatin C in the 3 rd day after donation, respectively, had the largest area under curve and best sensitivity and specificity for Stage 1 (risk) AKI prediction. During the immediate three days after donation, about half of patients suffered from AKI; mostly Stage 1 (injury). The sequence of the emergence of s-NGAL and s-cystatin C in the 1 st and 3 rd days as biomarkers with highest accuracy and power for RIFLE criteria defined AKI stage discrimination in our study was comparable to previous studies. We conclude that our study suggests that AKI was best detected in the 1 st day after uninephrectomy by the s-NGAL levels, whereas cystatin C was the best in the 3 rd day after donation for detection of AKI. We retrospectively compared induction therapy utilizing alemtuzumab and antithymoglobulin (ATG) in high-risk kidney transplant recipients in our center. Two hundred and fifty-one patients underwent kidney transplantation between 2009 and 2012. The high-risk patients were defined as those who had two or more times kidney transplantation and/or more than 30% panel reactive antibody. We studied 130 high-risk kidney transplant candidate; 58 (44.6%) patients received induction immunosuppressive therapy with alemtuzumab, and 72 (55.4%) with ATG. Delayed graft function developed in 11 patients receiving alemtuzumab, against the 27 patients who receiving ATG (P = 0.021). Acute cellular rejection episodes were observed in five patients in the alemtuzumab group and 19 patients in the ATG group (P = 0.009). There were three graft failures in the alemtuzumab group and eight graft failures in the ATG group due to rejection episodes. We found immunosuppressive induction therapy with alemtuzumab a significantly less incidence of acute rejection and delayed graft function than induction therapy with ATG in the high-risk kidney transplant recipients. It is essential to ascertain the state of health and renal function of potential kidney donors before organ removal. In this regard, one of the primary steps is to estimate the donor's glomerular filtration rate (GFR). 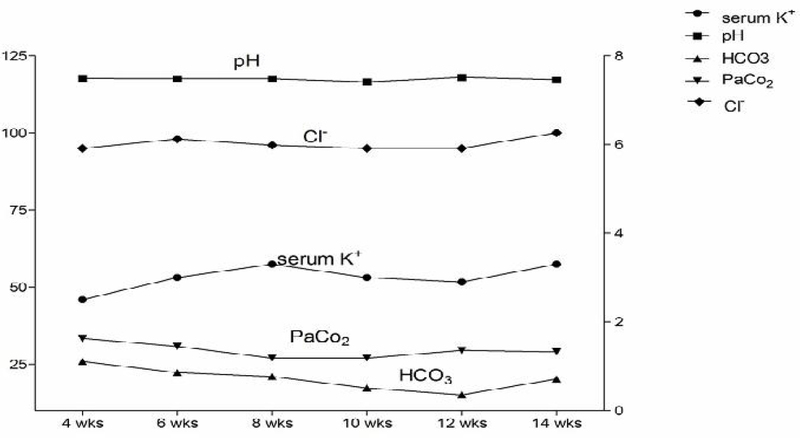 For this purpose, the modification of diet in renal disease (MDRD) and the Cockcroft-Gault (CG) formulas has been used. However, these two formulas produce different results and finding new techniques with greater accuracy is required. Measuring the renal volume from computed tomography (CT) scan may be a valuable index to assess the renal function. This study was conducted to investigate the correlation between renal volume and the GFR values in potential living kidney donors referred to the multislice imaging center at Alzahra Hospital during 2014. The study comprised 66 subjects whose GFR was calculated using the two aforementioned formulas. 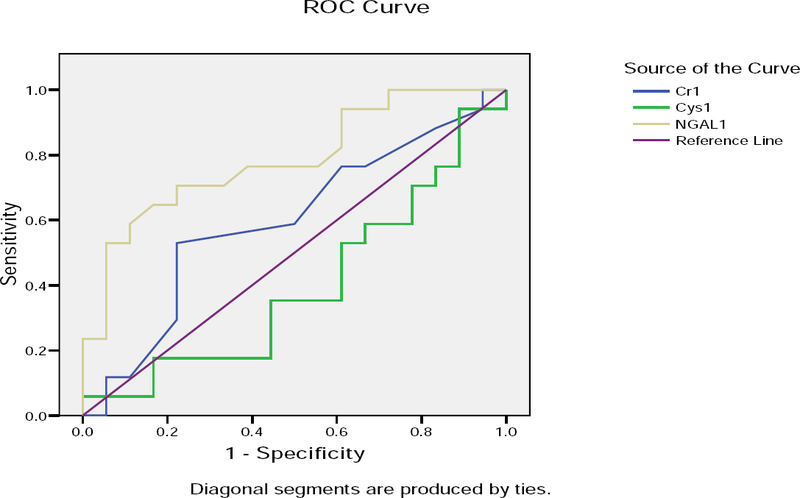 Their kidney volumes were measured by using 64-slice CT angiography and the correlation between renal volume and GFR values were analyzed using the Statistical Package for the Social Science software. There was no correlation between the volume of the left and right kidneys and the MDRD-based estimates of GFR (P = 0.772, r = 0.036, P = 0.251, r = 0.143, respectively). A direct linear correlation was found between the volume of the left and right kidneys and the CG-based GFR values (P = 0.001, r = 0.397, P <0.001, r = 0.465, respectively). The kidney volume derived from multislice CT scan can help predict the GFR value in kidney donors with normal renal function. The limitations of our study include the small sample size and the medium resolution of 64-slice multislice scanners. Further studies with larger sample size and using higher resolution scanners are warranted to determine the accuracy of this method in potential kidney donors. Hepatitis-C virus (HCV) infection remains highly prevalent among hemodialysis (HD) patients, but there is a notable paucity of information on aspects of bio-incompatibility in those infected patients. This study aimed to answer the following question: In HD patients, does chronic HCV infection attenuate the acute inflammatory response that results from contact of patient's blood with the dialyzer membrane? We elected to investigate the contact response in the initial 15 min of a standardized single dialysis session in a before-after design. Thus, we compared magnitude of dialysis-induced changes in total leukocyte counts, platelet counts, and C3a levels in a cohort of HCV-infected and a cohort of non-infected dialysis patients (57 patients in each group). Distribution of gender, age groups, and hypertension was comparable in both HCV-infected and non-infected patients. Furthermore, the baseline pre-dialysis measurements of the studied biocompatibility markers showed statistically equivalent values in the two groups with the exception of a marginally lower platelet count among HCV-infected patients. After 15 min of HD, the total leukocyte count dropped by 16% in HCV-infected patients and by 21.5% in the non-infected group (P <0.01). However, in both groups of patients, all values remained within the customary warm zone of normal distribution of these cells in the general population. There was no statistically significant difference between the two groups in dialysis-induced thrombocytopenia or C3a levels. The magnitude of cell count reduction and complement activation in both the HCV-infected and non-infected groups of HD patients was modest and unlikely to symbolize any clinical relevance. A valid answer to our research question may be only distinctly obtained if novel molecular and sub-molecular biomarkers for detection of micro-inflammation are used. Willis-Ekbom's disease/restless legs syndrome (WED/RLS) has been described in subjects undergoing hemodialysis (HD). Different studies have reported varying prevalence rates and different factors associated with this condition; however, the results are inconsistent. Thus, this study was conducted to assess the prevalence of WED/RLS in patients undergoing HD. Another aim of the study was to identify if any comorbidities or biochemical factors were associated with this condition. A total of 194 adult patients undergoing maintenance HD were included in this study. They were screened for WED/RLS using International RLS Study Group criteria on the face-to-face interview and clinical examination. Most recent laboratory parameters were gathered from the medical records. In addition, seroreactivity to hepatitis B and C was also recorded. The mean age of all the subjects included in the study was 54.4 ± 15 years (range: 18-92 years); 58.2% were males. The mean duration on HD was 36.6 ± 19.3 months. WED/RLS was seen in 5.2% of the study subjects. Subjects with and without WED/RLS were comparable with regard to gender (P = 0.23), adequacy of dialysis (P = 0.82), shift of dialysis (P = 0.93), presence of diabetes mellitus (P = 0.91), hypertension (P = 0.26), smoking (P = 0.22), alcohol use (P = 0.45), and reactivity to hepatitis C (P = 0.19) and hepatitis B (P = 0.80), as well as various hematological and biochemical parameters. The prevalence of WED/RLS of 5% in the HD group was higher than in the general population. However, this study could not find any correlation between RLS and any biochemical parameters or comorbidities. This is an important area to be considered in future and requires more work with larger sample size. This study was performed to assess the cardiovascular disease (CVD) risk factors in the prevalent peritoneal dialysis (PD) and hemodialysis (HD) patients and their association with cardiovascular events (CVEs) in a Saudi end-stage renal disease cohort. This was a prospective, observational, single-center study. A total of 192 patients were screened of which 157 patients were eligible (HD = 121, PD = 36). All patients underwent assessment of cardiovascular risk factors at the time of enrollment including electrocardiogram and echocardiography, lipid profile, homocysteine, and insulin levels. Patients were followed for one year and CVE [acute myocardial infarction, cerebrovascular accident (CVA), and congestive heart failure] and mortality were recorded. SPSS ® Version 16 was used for the analysis. T-test and ANOVA were used for continuous data; categorical data were analyzed using Chi-square and Mann-Whitney tests. The primary end-point of CVE and all-cause mortality was compared in the two groups using Kaplan-Meier survival analysis. 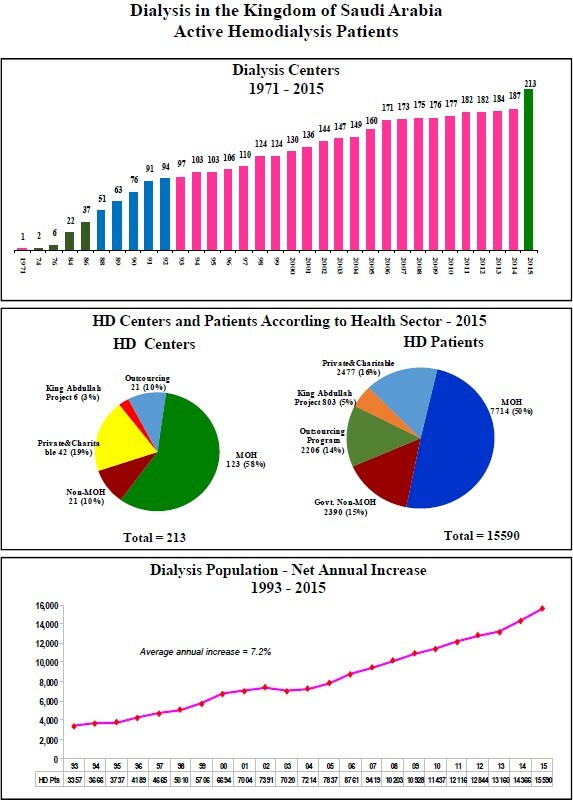 HD patients were older and had been longer on dialysis. While PD patients had higher urine output and better Kt/V values, they were more edematous and using more antihypertensive medications. PD patients also had a lower ejection fraction (EF). Age >57 years and the use of more than one antihypertensive medication were associated with higher risk of CVE, while EF >53 was found to be protective. Age >57 years and EF <53 at enrollment were predictive of all-cause mortality. 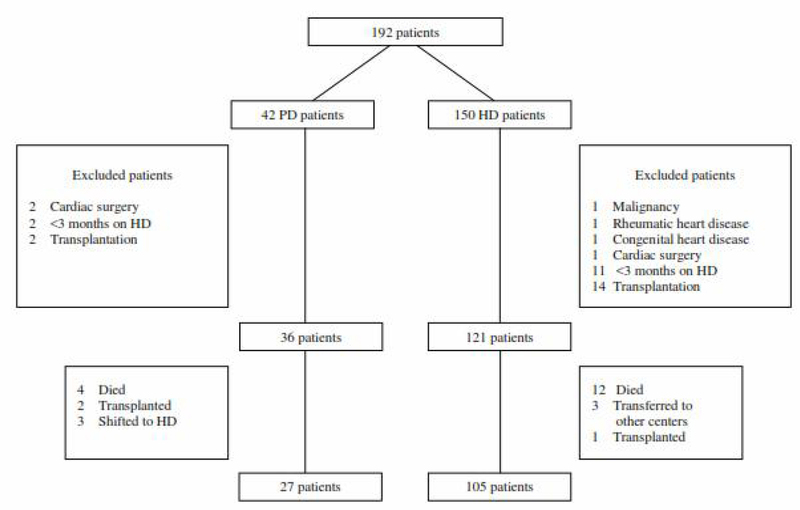 Saudi patients undergoing PD have worse CVD risk profiles compared to HD patients. Age less than 57 years and an EF >53 were cardioprotective. Hemodialysis (HD), despite being the most common treatment modality for endstage renal disease (ESRD), still carries a mortality rate higher than 20-50%/year resulting from various comorbidities. The aim of this study was to measure the plasma level of pentraxin-3 (PTX-3) in patients on maintenance HD and to assess its relationships to comorbidities such as malnutrition and associated comorbid diseases. This case-control study included 50 HD patients, 30 ESRD patients, and 30 healthy controls. HD patients were classified into different subgroups according to the Davies comorbidity index and malnutrition score. Plasma PTX-3 was analyzed by a sandwich ELISA technique. Plasma level of PTX-3 reached its highest levels in HD patients followed by ESRD patients as compared to healthy controls. 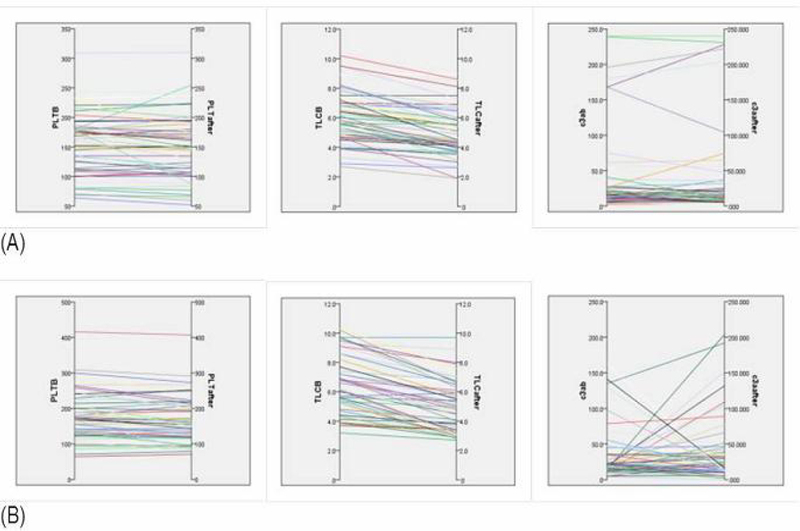 Moreover, within the different subgroups, the highest levels and the highest odd ratio of PTX-3 were detected in the subgroups having the highest Davies comorbidity index or the highest malnutrition score as compared to the other subgroups. At a cutoff of 0.6 ng/mL, PTX-3 was able to discriminate HD patients with low Davies comorbidity index from those with both medium and high Davies comorbidity index with a diagnostic sensitivity of 92.5% and a diagnostic specificity of 70.0%. Meanwhile, the best cutoff of plasma PTX-3 for discriminating patients with mild malnutrition from severe and moderate malnutrition was 0.6 ng/mL with a diagnostic sensitivity of 90.9% and a diagnostic specificity of 41.2%. In conclusion, PTX-3 appears to be a clinically useful marker for the early identification of patients with renal failure on maintenance HD who are at substantially increased risk of morbidity. These patients may require care and aggressive follow-up in more specialized units and an early referral to a renal transplant center. To determine the efficacy and safety profile of rhubarb and α-keto analogs of essential amino acids supplementation in patients of diabetic nephropathy (DN), we studied 96 patients of DN attending a tertiary care center of the North India. The patients were randomly divided into three equal interventional groups. Group I (control) that received conservative management along with placebo, Group II (rhubarb) that received conservative management along with rhubarb capsule (350 mg, thrice daily), and Group III [keto amino acid (KAA)] that received conservative management along with α-keto analogs of essential amino acids (600 mg, thrice daily). The treatment was continued for 12 weeks. Clinical and biochemical parameters were assessed at 0, 4, 8, and 12 weeks of treatment. A progressive improvement in clinical features and biochemical parameters was seen in all three groups after 12 weeks of treatment. The KAA group showed more marked improvement in clinical features as well as biochemical parameters compared to the rhubarb group. There was a reduction in blood glucose, blood urea, serum creatinine, and 24 h total urine protein. There was an increase in hemoglobin, 24 h total urine volume, and glomerular filtration rate. There was no statistical difference between the rhubarb and KAA groups with respect to side effects (P > 0.05). Our study suggests that KAA is more effective than rhubarb as add-on therapy with conservative management in patients of DN. To compare the efficacy of mycophenolate mofetil (MMF) with that of azathioprine (AZA) drugs in the maintenance therapy of lupus nephritis (LN) patients, we studied 81 Sudanese patients with LN (32 in Class III, 34 in Class IV, and 15 in combined Class V + IV of the ISN/RPS 2003 Classification). All patients received induction therapy consisting of monthly intravenous pulse doses of cyclophosphamide (CYC) (500 mg/m 2 of body-surface area) for six months, plus three consecutive pulses of intravenous methylprednisolone 15 mg/kg/day of body weight (maximum 500 mg). Subsequently, 41 (50.6%) patients were randomized into a group that received oral MMF (22 mg/kg/day), and 40 (49.4%) patients randomized to a group that received oral AZA (2 mg/kg/day). All patients initially received oral prednisone (1 mg/kg of body weight daily) for four weeks. The baseline characteristics of the two groups were similar. Total remission rate was 75.3% (80.5% in MMF and 70% in AZA), complete remission rate of 54.3% (56.1% with MMF and 52.5% with AZA), and a partial remission rate of 21% (24.4% with MMF and 17.5% with AZA) over 29 months. 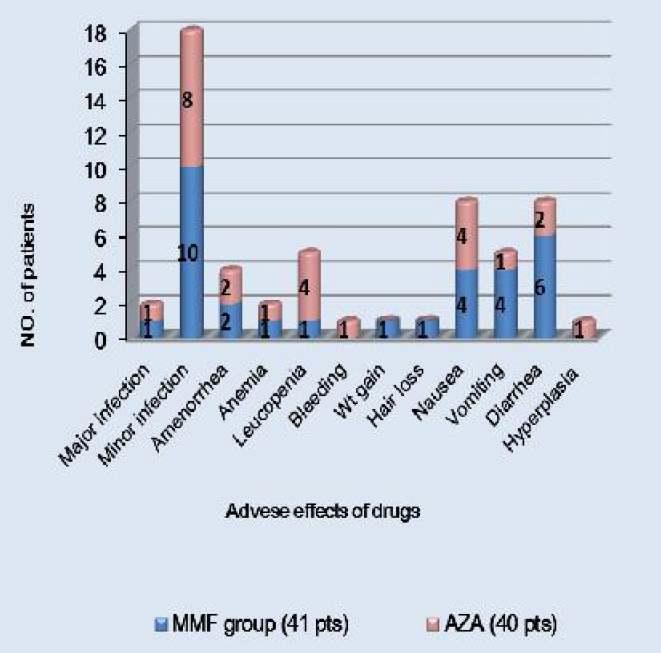 During maintenance therapy, six patients died (four in the AZA group and two in the MMF group), and end-stage renal disease (ESRD) developed in five patients (three in the AZA group and two in the MMF group). During the 36-months of the study, both groups had comparable event-free survival rate for the composite end point of death or ESRD and rate of relapse-free survival. Furthermore, both groups had no significant differences in terms of frequency of hospitalization, amenorrhea, infection, nausea, and vomiting. We conclude that our study showed that short-term therapy with intravenous CYC followed by maintenance therapy with oral MMF or AZA had similar efficacy and safety for the treatment of patients with moderate to severe LN. Data about aldosterone production and excretion in the neonatal period are still few and controversial. Our objectives are to assess urinary aldosterone excretion (UAE) in very low birth weight (VLBW) infants and to identify clinical and biochemical variables that may influence this excretion. Thirty VLBW infants (14 males and 16 females), their gestational age <32 weeks and body weight <1500 g, were included in the study. Demographic and clinical data were recorded, within the first 72 h of life and urine and blood samples were collected for the measurement of urinary aldosterone and serum potassium, sodium, and chloride. The mean UAE value was 0.176 ± 0.05 μg/24 h and the mean absolute UAE was 1906 ± 271 pg/mL. 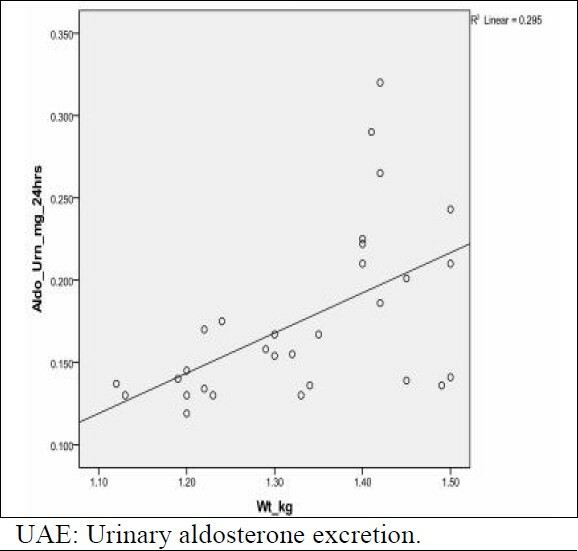 There was a statistically significant positive correlation between UAE and gestational age and birth weight; also, infants with respiratory distress syndrome had higher urinary aldosterone levels than infants without respiratory distress. Only plasma sodium was a significant independent factor that negatively influenced UAE on linear regression analysis. The renin-angiotensin-aldosterone system of VLBW infants seems to be able, even immediately after birth, to respond to variations of plasma sodium concentrations; measurement of UAE constitutes an interesting method to determine aldosterone production in VLBW infants. Growth failure is a major problem in pediatric patients with chronic kidney disease (CKD), and the onset of the condition in infancy is more likely to have an adverse impact on growth than its development in later childhood. This study was aimed to assess nutritional intake and anthropometry of children presenting with CKD in a developing country. In this cross-sectional observational study, children (1-18 years) with CKD visiting the outpatient services were enrolled. The age of onset, cause of CKD, and anthropometry were recorded. Dietary intakes from three 24 h dietary recall (2 mid-week and 1 weekend day) were recorded. A blood sample was taken from all subjects for biochemical parameters. A total of 45 children (forty males and five females) with CKD underwent nutritional assessment. The median age at assessment was 108 months (13-167). Twenty-seven (60%) subjects had CKD stage 1, 2, or 3 while the remaining 40% had CKD stage 4 or 5. Of the 45 children, 27 (60%) had moderate to severe malnutrition at assessment. The mean weight and height (standard deviation scores) were −2.77 ± 2.07 and −2.30 ± 1.38, respectively. The prevalence of growth retardation was much higher in late stages of CKD; the difference was statistically significant (P <0.01). The mean caloric deficit from recommended daily allowance was −40.33% for calories, +6.2% for proteins, and −10.51% for fats. The diet was highly deficient in iron (mean 48.9% deficit); deficient in calcium (mean −22.2%) and had excess phosphates (mean 18.3%). There was a progressive decrease in intake of nutrients in advanced stages of CKD. There was a high prevalence of malnutrition (60%) in children with CKD, especially in higher stages of CKD. An appropriate dietary assessment and nutritional counseling should be planned for all patients with CKD to prevent complications associated with malnutrition and anemia. Acute kidney injury (AKI) is a common and serious complication in patients in the Pediatric Intensive Care Unit (PICU). We conducted this study to estimate the incidence and the mortality rate of AKI in critically ill children as well as to describe some other related factors. A retrospective study was conducted at PICU of Queen Rania Abdulla Children Hospital, Amman, Jordan for the period extending from May 2011 to June 2013. The medical records of all patients admitted during this period, and their demographic data were reviewed. Patients with AKI were identified, and management and outcomes were reviewed and analyzed. AKI was evaluated according to modified RIFLE criteria. Of the 372 patients admitted to PICU, 64 (17.2%) patients developed AKI. Of these 64 patients who had AKI, 28 (43.7%) patients reached RIFLE max of risk, 21 (32.8%) patients reached injury, and 15 (23.4%) reached failure. Mean Pediatric Risk of Mortality II score at admission was significantly higher in patients with AKI than those without P <0.001. The age ranged between one month and 14 years with the median age as 5.4 year. Thirty-five (54.7%) were males. Sepsis was the most common cause of AKI. The mortality rate in critically ill children without AKI was 58.7%, whereas increased in children with AKI to 73.4%. The mortality rate in patients who received renal replacement therapy was 71.4% and was higher (81.5%) in patients who received mechanical ventilation (95%, [confidence interval (CI)] 79.3-83.4%) and was significantly higher in patients with multi-organ system dysfunction 90.3% (95%, [CI] 88.7-92.5%). The incidence of AKI in critically ill children is high and increased their mortality rate and higher mortality seen in the younger age group, especially those below one year. High mortality rate was associated with multi-organ system dysfunction and the need for mechanical ventilation. Gastrointestinal (GI) bleeding due to angiodysplastic lesions is a common problem among patients receiving hemodialysis (HD). We studied 22 HD patients (5 females and 17 males) who had GI bleeding due to angiodysplasia; the mean age of whom was 54 ± 10 years. All patients had upper and lower GI endoscopy. 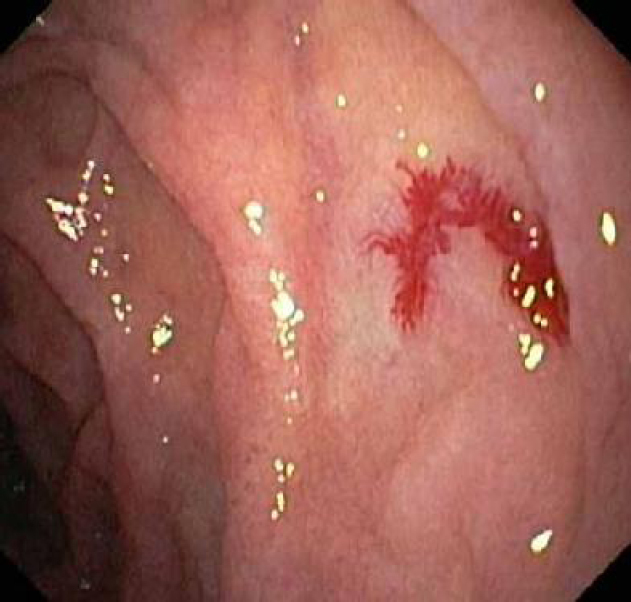 The most common site for the lesion was the right colon in seven cases (31.8%), followed by stomach in 4 cases (18.1%). In eight (36.3%) patients, there were multiple lesions located in the stomach, duodenum, and the right colon. All patients were treated with coagulation; with argon plasma in 14 (63.6%) patients, bipolar coagulation in five (22.7%) patients, and hot clip in three (13.6%) patients. One patient who presented with persistent bleeding despite endoscopic therapy was well-benefited of a complementary treatment, thalidomide. Hemostasis was obtained in all patients after an average of 6.8 sessions of endoscopic coagulation procedure. We conclude that angiodysplasia is a frequent cause of hemorrhage in chronic renal failure that can be managed in most patients by argon plasma and bipolar coagulation. Acute kidney injury (AKI) is associated with adverse short-and long-term outcomes. The aim of this study was to evaluate the incidence of AKI and the short-term mortality in patients admitted with acute coronary syndrome (ACS) to a single coronary care unit (CCU) in Tripoli, Libya. We retrospectively studied the medical records of ACS patients admitted to the CCU of a referral cardiology center, during the period from January 1, 2014, to December 31, 2014. AKI was defined according to the AKI network criteria. The incidence of AKI and short-term CCU mortality was compared between different types of ACS. Data of patients with and without AKI were compared using Student's t-test and Chi-squared statistic considering P <0.05 statistically significant. Eighty-four patients with ACS were included in the study; their mean age was 57.6 ± 14.4 years [standard deviation (SD)], 75% were males and their mean stay in the CCU was 4.3 ± 3 days (SD). Of them, 71.4% had ST-elevated myocardial infarction (STEMI), 22.6% had non-STEMI, and 6% had unstable angina. 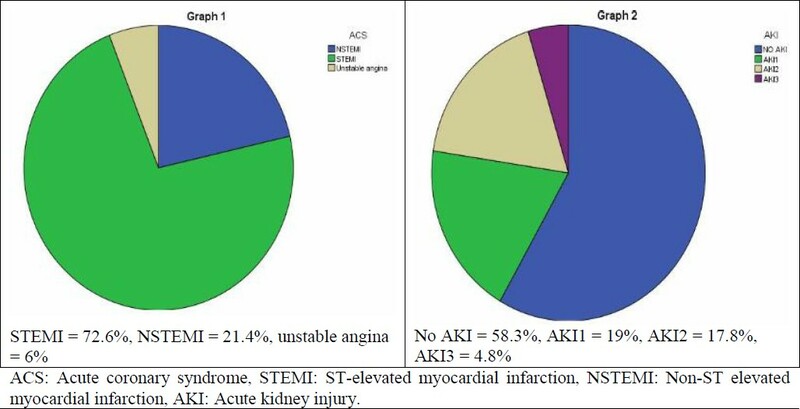 About 41.7% had AKI (19% had AKI Stage 1, 17.9% had AKI Stage 2, and 4.8% had AKI Stage 3). The total CCU mortality was 15.5%; mortality among AKI patients in the CCU was 25.7% compared with 6.12% in the non-AKI patients (P = 0.014). The mortality worsened with increasing severity of AKI. Patients with AKI were older (61.6 ± 15 years) than the non-AKI group (54.7 ± 13 years, P = 0.031), their mean blood pressure at admission was lower, their CCU stay was longer, and they more frequently had coexisting acute decompensated heart failure. In this study of ACS patients, the incidence of AKI was high, the CCU mortality among the AKI patients was 25.7% compared with 6.12% in the non-AKI patients, and the mortality worsened with increasing severity of AKI. The medical staff could play a major role in promoting for organ donation. The aim of our study was to assess the attitudes of the medical staff toward organ donation. It is a prospective study conducted over a period of six months. A questionnaire was distributed and explained to the medical staff in our institute. Fifteen questions were designed to include four main themes: sociodemographic information, attitude toward organ donation, perceived knowledge about organ donation, and reasons for refusal or acceptance of organ donation. Among the 245 respondents, 36.3% had prior knowledge about organ transplantation, 31.8% knew about the law of organ donation, 43.2% had already donated blood sometimes, 65.7% expressed their consent to organ donation during their lifetime, and 82.8% expressed their agreement to donation after their death. The grounds for refusal were generally: a misunderstanding of risks, desire for respect of corpse. The religious and the ethical motive were present too as a ground for decision making. The medical staff is the key for organ donation. To promote organ transplantation, personnel should be well informed about ethical, moral, and religious dimensions of organ donation and transplantation. Peritoneal dialysis (PD) program was established in Farwaniya Hospital Kidney Center, Kuwait, in February 2011. Patient recruitment for this modality of treatment was growing steadily. One of the major complications of PD is peritonitis. There is a belief that PD therapy is inferior and carries more complications than hemodialysis, we aimed to show that PD is a good and a non-inferior option for dialysis therapy with comparable outcome in both patient and technique survival. 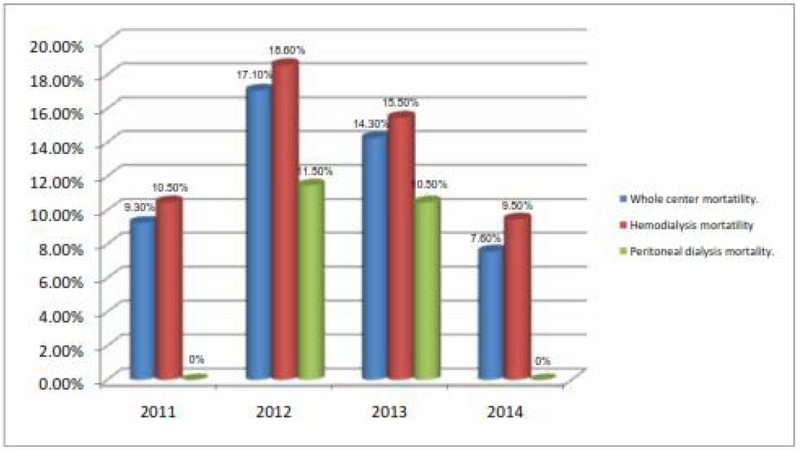 This was a retrospective analysis of all patients who were on PD from February 2011 to December 2014. Peritonitis rate, exit site infection rate, and all-cause mortality rate were all assessed for this period. Peritonitis rate during the 1 st year, 2011, was 0.92 incidents/year. This number had progressively declined in the following years; in 2012, it was 0.65 incidents/year; in 2013, it was 0.58 incidents/year; and in 2014, it was 0.38 incidents/year. This improvement in the rate of peritonitis incidence could be explained by better education of patients and meticulous supervision of the nursing staff. Farwaniya Hospital Kidney Center had an all-cause mortality rate of 9.3% among patients on renal replacement therapy in 2011. In 2012, all-cause mortality rate increased to 17.1%. The following year, 2013, it decreased to 14.3%, and in 2014, all-cause mortality rate dropped further to 7.6%. All-cause mortality rate among PD patients was zero in 2011. In 2012, the all-cause mortality rate in PD was 11.54%, and in 2013, it decreased to 10.52%. Then, again in 2014, the all-cause mortality rate among PD patients was zero. This improvement in all-cause mortality rate could be explained by the better medical care offered to the end-stage renal disease patients, in particular PD patients, in Farwaniya Hospital Kidney Center. Renal transplantation is well established in the USA, Europe, India, and South Africa. However, it is still in its infancy in Nigeria. The objective of our study is to determine the knowledge, awareness, and acceptability of renal transplant among patients with end-stage renal disease (ESRD) and the factors which are responsible for the low level of transplantation in Ibadan, Nigeria. A 15-item pilot-tested questionnaire was administered to willing patients with ESRD seen at the medical outpatient clinic of the University Teaching Hospital, from January to December 2011. There was 81% participation rate of the respondents. Exactly 90.1% had formal education and 44% earned <50,000 naira per month. Seventy-nine percent of respondents was aware of renal transplantation, 70.4% would recommend it to others, and 66.7% accepted renal transplantation; 77.8% would maintain a close relationship with their donors. About 61.7% considered it very expensive, while 33.3% did not know the cost for transplantation. Of the reason for the low level of kidney transplantation in Nigeria, 39.5% had no idea and in 27.2% of the respondents, the fear of death by potential donors may be responsible. Eleven percent of responded that recipients had no money for kidney transplantation and another 11% thought the potential donors would like to be paid for donating their kidneys. Most of the respondents with ESRD were knowledgeable, aware of, and accepted renal transplantation as the next step to treat chronic renal failure. However, majority of these patients could not afford the cost for renal transplantation. Reusing dialyzers is almost universal in developing countries to reduce the cost of hemodialysis (HD). Economic benefits of dialyzer reuse, when estimated only on the basis of the dialyzer and its consumables are very significant and attractive. 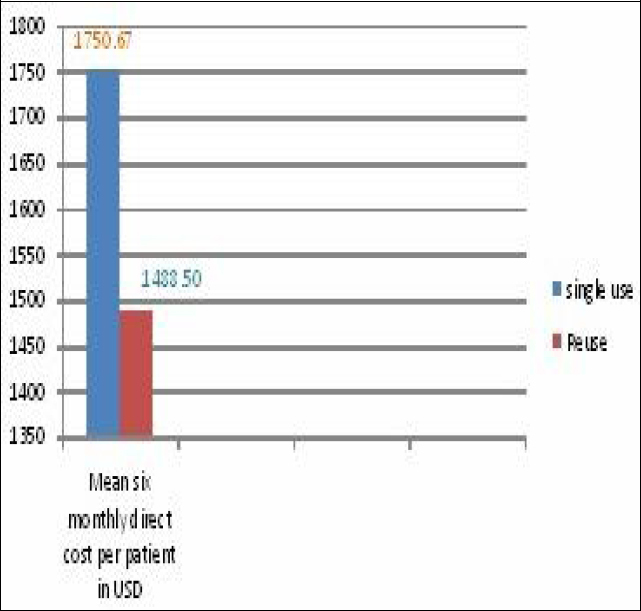 In this study, we compared the cost of mechanical reuse of dialyzer considering all of the direct costs (medications, dialyzer, and its consumables, disinfection fluid, and hospitalization if any) in HD treatment, which if significantly different between single use and reuse, can nullify the obvious cost benefits. A total of 70 adult patients of any gender on maintenance HD at The Kidney Centre Post Graduate Training Institute for more than three months were included. Equal numbers of patients were on single use (Group A) and reuse of dialyzer (Group B). Both groups were compared for total direct costs of HD over a six months period. Average six monthly total direct cost per patient of Group A was significantly high as compared to Group B, the United States Dollar (USD) 1750.67 ± 135.31$ vs. USD 1488.50 ± 132.23$); difference USD 262.18$ (P <0.001). The total cost saving being 14.97% in Group B. Our study shows that dialyzer reuse provides a significant economic benefit and remains a means of reducing the cost of HD. Petroleum products have been associated with acute and chronic kidney disease. Nigeria is a major oil producing and exporting country. The aim of this study was to screen for kidney disease in an oil producing community in Nigeria. This was a cross-sectional study carried out in Ido, Asari-Toru Local Government Area of Rivers State. All subjects were resident in the town and those aged 18 years and above were eligible. Spot urine samples were collected for dipstick urinalysis, and venous blood was collected for estimation of serum electrolyte, urea, creatinine, and lipid profile. The estimated glomerular filtration rate (eGFR) was calculated using the Cockcroft and Gault formula. A total of 99 participants were screened: 75% were females, over 50% aged above 50 years, and the majority had low socioeconomic status. The mean eGFR of the participants was 80.2 ± 33.3 mL/min/1.73 m 2 , 32.6% of the participants had eGFR <60 mL/min, and 2% had eGFR <30 mL/min. Furthermore, 36.5% of the participants had proteinuria and 29.8% had 1 + proteinuria. There was a significant negative correlation of eGFR with a family history of diabetes mellitus (−0.35, P = 0.016), elevated systolic hypertension (−0.29, P = 0.035), and elevated total cholesterol (−0.23, P = 0.045), but there was a positive correlation with body mass index (0.24, P = 0.018). We conclude that the prevalence of kidney disease was high in the screened population in a Nigerian oil producing community. Malignancy is a significant long-term complication of successful renal transplantation. Not only the rate is higher but also cases are highly aggressive. 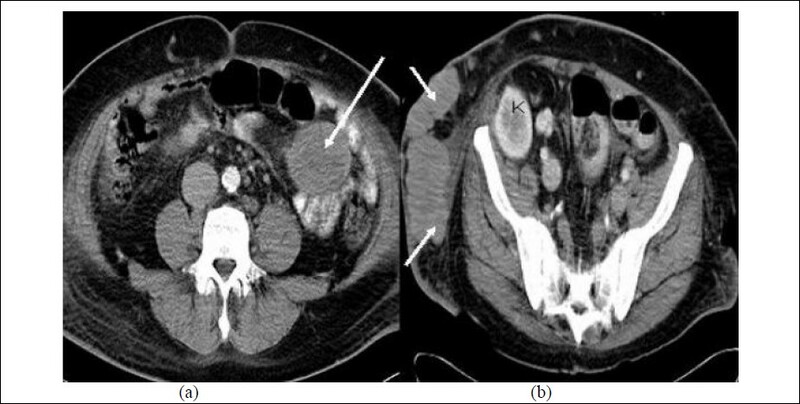 We report a case of metastatic, small cell, neuroendocrine tumor in a post-renal transplant patient with progressive left inguinal nodes and right lumbar swellings. 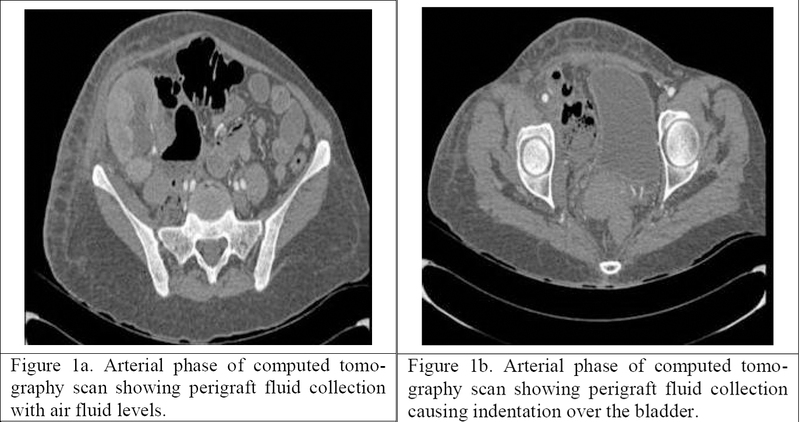 He had a remarkably elevated serum lactate dehydrogenase levels with multiple metastatic masses in the left inguinal, left iliac fossa, and right lower abdominal wall on abdominal computed tomography scan. Excisional biopsy of a left inguinal node revealed extensive infiltration with malignant cells in it. Immunohistochemistry staining was positive for synaptophysin, prostatic specific antigen, and CD56. While the primary small cell carcinoma of genitourinary organs is rare, the case illustrates the highly aggressive nature of the disease in a kidney transplant recipient. Primary hyperoxaluria Type-1 (PH-1) is caused by a deficiency of alanine-glyoxylate aminotransferase manifesting as urolithiasis, nephrocalcinosis, and end-stage renal disease (ESRD). Among treatment options, best outcomes have been achieved by sequential liver-kidney transplantation (Seq-LKT). Herein, we report a patient with PH-1 and ESRD who underwent Seq-LKT in Iran. Criteria for diagnosis included a history of recurring calcium oxalate renal stones and elevated urine oxalate level combined with liver biopsy and absent enzymatic activity at the age of 13 years. Conservative treatment including pyridoxine, potassium citrate solution, high fluid intake, and hemodialysis was administered initially. Liver transplantation was performed at the age of 17 years from a deceased donor followed 4½ months later by a living-unrelated donor kidney transplantation. After two years of follow-up, the patient experienced no complications and had normal liver and renal function. This is the first successful experience of Seq-LKT in the treatment of PH-1 in Iran as a developing country with limited access to equipment and medications. Lymph node involvement as a part of systemic vasculitis is rare. We report a case of women with rapidly progressive renal disease associated with recurrent epigastric pain, weight loss, and massive hilar as well as para-aortic lymphadenopathy. Ultrasound-guided biopsy of her scarred kidneys revealed antineutrophil cytoplasmic antibody-negative crescentic glomerulonephritis and that of lymph nodes showed severe necrotizing vasculitis. Biopsy of the lymph nodes and the failing kidney established the diagnosis of this rare presentation and ruled out lymphoma and tuberculosis. Administration of corticosteroids and cyclophosphamide resulted in a favorable outcome. The simultaneous presence of multiple immune-mediated diseases in a single host is rare. The implications of such coexistence relating to the disease pathogenesis and treatment are not well understood. We describe two cases of renal failure with immune-mediated overlap conditions. We believe, this is the first reported case of antineutrophil cytoplasmic antibody (ANCA) associated vasculitis coexisting with atypical hemolytic uremic syndrome (HUS). Two boys aged eight years (Case 1) and 10 years (Case 2) presenting with renal failure secondary to glomerulonephritis are described. Based on the clinical features, a detailed immunological workup and kidney biopsy was performed to arrive at the diagnosis. Immune-mediated renal dysfunction was present in both cases. Screening for other coexisting autoimmune phenomenon was performed based on suspicious clinical features. Case1 presented with renal failure and D-HUS with low serum C3. 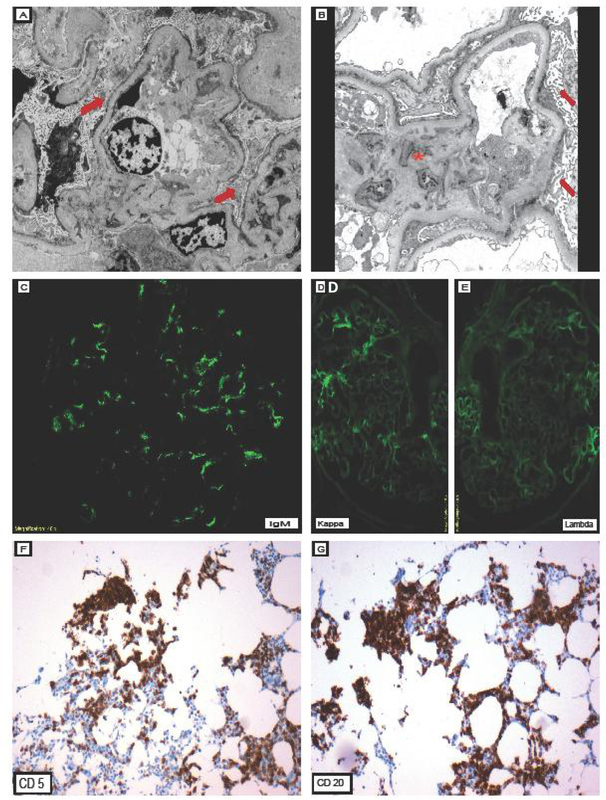 Renal biopsy revealed membranoproliferative glomerulonephritis Type 1. The child improved following treatment with plasma infusions and steroids. Case 2 presented with ANCA-positive vasculitis. Renal biopsy was suggestive of focal mesangioproliferative glomerulonephritis. Disease course was further complicated by D-HUS with low serum C3. Factor H antibody was positive. Complete renal recovery was documented following treatment with intravenous rituximab, steroids, cyclophosphamide, and plasmapheresis. Screening for the presence of coexisting autoimmune diseases is imperative to identify covert immune-mediated pathologies and for the successful overall management of such cases. Fanconi syndrome (FS) in an adult patient is an unusual finding and it merits thorough evaluation. Paraproteinemias are one of the common etiologies in adult FS and need to be ruled out. Among the various forms of renal involvement in multiple myeloma, light chain proximal tubulopathy (LCPT) is the rarest. 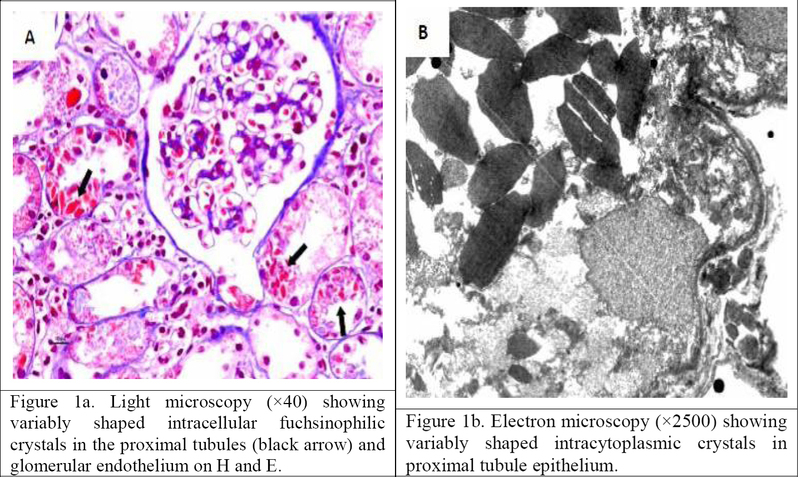 Usually, it causes proximal tubular dysfunction which is characterized by intracytoplasmic deposition of crystallized, mostly kappa monoclonal light chains in proximal tubules; however, glomerular crystal deposition is unusual. Herein, we are presenting a patient with renal dysfunction and FS. 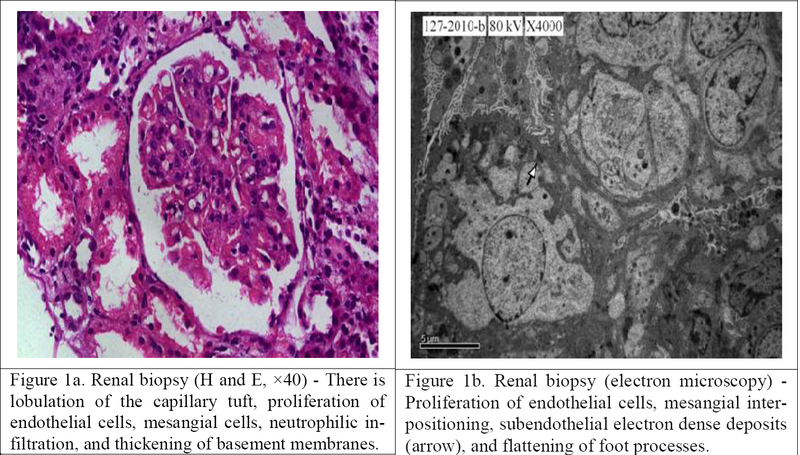 On evaluation, she was found to have multiple myeloma and renal biopsy showed LCPT with extensive crystal deposition in the proximal tubular epithelium along with crystal deposition in the glomerular capillary endothelium. The treatment of the underlying multiple myeloma caused remission of the FS. Tenofovir disoproxil fumarate (TDF) is a nucleotide reverse transcriptase inhibitor discovered in the USA in 2001. It is currently the treatment of choice for patients co-infected with human immunodeficiency virus (HIV) and hepatitis B virus. Its antiretroviral efficacy and good tolerance are responsible for the higher frequency of prescriptions compared with other nucleoside analogs. However, it can induce acute renal toxicity causing impairment of the proximal tubular function of the kidney. This is highly dependent on factors such as associated co-prescription didanosine or a protease inhibitor "boosted" with ritonavir, preexisting renal insufficiency, low body weight, or presence of associated diabetes. In contrast, long-term renal toxicity remains highly debated. Some studies describe a decrease in estimated glomerular filtration rate during prolonged treatment with TDF. Others reported renal safety even during prolonged use. The differences between patients enrolled in the different studies, the measured parameters and their interpretation could explain these discrepancies. 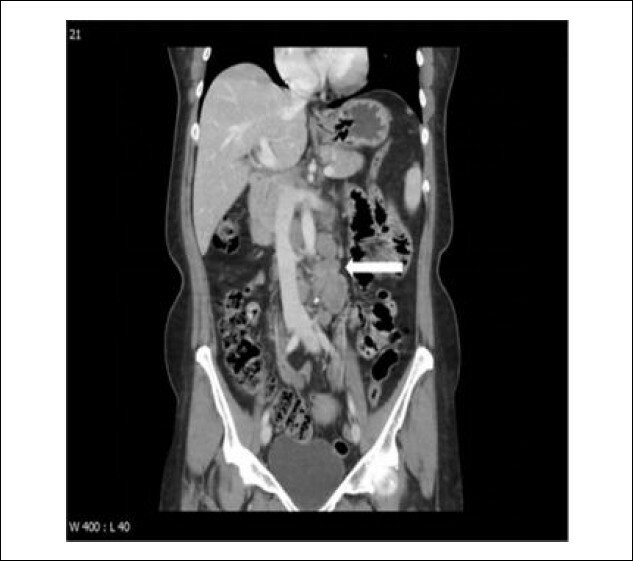 We describe a case of a patient infected with HIV, who presented with Fanconi syndrome with acute renal failure six months after starting antiretroviral treatment including tenofovir. Proximal renal tubular acidosis (RTA), also known as Type II RTA, is characterized by a defect in the ability to reabsorb bicarbonate (HCO 3 ) in the proximal tubule. It is usually associated with generalized dysfunction of the proximal tubule as part of Fanconi syndrome. Very few case reports in the literature support Vitamin D deficiency as a cause of proximal RTA. 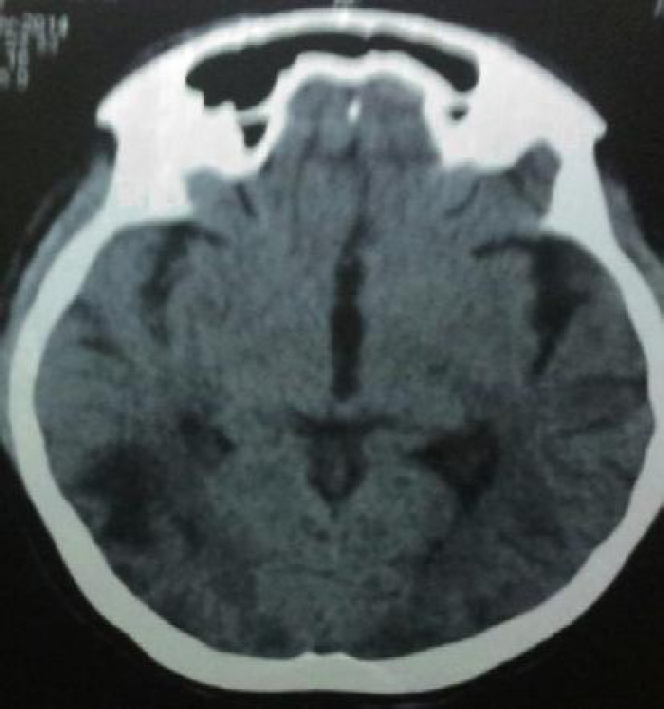 We present a case of a young female who presented with proximal RTA and Fanconi syndrome and excellently responded to Vitamin D replacement. Thus, work-up for the etiology of proximal RTA should include Vitamin D levels since replacement of this vitamin in those who are deficient can lead to cure of such patients. Kidney injury associated with lymphoproliferative disorders is rare, and the exact pathogenetic mechanisms behind it are still poorly understood. Glomerular involvement presenting as a nephrotic syndrome has been reported, usually secondary to membranoproliferative glomerulonephritis. We report a case of a 63-year-old male who presented with bilateral leg swelling due to nephrotic syndrome and acute kidney injury. A kidney biopsy showed minimal change disease with light chain deposition; however, no circulating light chains were present. This prompted a bone marrow biopsy, which showed chronic lymphocytic leukemia (CLL) with deposition of the same kappa monoclonal light chains. Three cycles of rituximab and methylprednisolone resulted in remission of both CLL and nephrotic syndrome, without recurrence during a three-year follow-up.